NASA has signed a deal with Alliant Techsystems, the company that provided the space shuttle fleet's solid rocket boosters, to help develop a new vehicle that could launch astronauts into orbit by 2015, the space agency announced today (Sept. 13). The new NASA deal with Utah-based Alliant Techsystems (ATK) is an unfunded Space Act Agreement to work together on the company's Liberty rocket. While NASA won't give ATK any money in the deal, the agency will provide expertise that could help ready the rocket for operational flights in the next four years, officials said. Under the agreement, which runs through next spring, 12 to 24 full-time NASA employees will help assess and develop Liberty, Mango told reporters today (Sept. 13). For 30 years, ATK provided the reusable twin solid rocket boosters that launched NASA's space shuttles to low-Earth orbit. The company was also tapped to develop the first stage of NASA's Ares 1 rocket, which would have launched astronauts under the agency's moon-oriented Constellation program. The engine the company built is similar to the shuttle's boosters, officials said. The company has teamed up with the European aerospace firm Astrium to build Liberty. The rocket will incorporate the Ares 1 engine as a first stage and Astrium's Ariane 5 rocket as a second stage. Liberty will stand about 300 feet (91 meters) tall, and it will be able to launch payloads of up to 44,500 pounds (20,185 kilograms), ATK officials have said. ATK and Astrium hope that NASA eventually selects Liberty to launch its crews to low-Earth orbit. Under its Commercial Crew Development (CCDev) program, the space agency is seeking to spur the capabilities of American private spaceflight companies. After the retirement of NASA's space shuttle program in July, the agency became dependent on Russian Soyuz vehicles to ferry astronauts to and from the International Space Station. CCDev aims to shift this taxi role to American private companies, hopefully by the middle of the decade. A number of private spaceflight firms are hoping to eventually score deals with NASA to transport its astronauts. The space agency has granted a handful of them development money in the last several years during two rounds of CCDev funding. ATK and Astrium put Liberty forward for the second round of funding, which was announced this past April. The rocket did not get any money. But the Space Act Agreement announced today shows that the agency is still interested in helping Liberty along, according to Mango. The overall aim of CCDev, he added, is to help develop several different viable American-led systems that could launch NASA astronauts to space. "We're very interested in helping ATK and their partners," Mango said. "We encourage them to go work with spacecraft providers, create those partnerships and then come forward and say now they have a solution." Though the Ariane 5 currently launches unmanned payloads, both components of Liberty were designed with a crew-carrying capability in mind, ATK officials said. That should give the rocket a leg up on other launch vehicles hoping to score a NASA crew-carrying contract, they added. Several different aerospace firms are developing crew-carrying spacecraft. 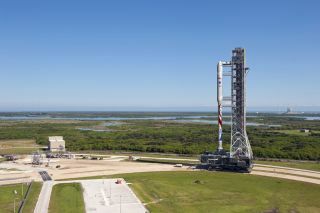 Rominger said ATK is in discussion with many companies about providing their launch services (with the exception of California-based SpaceX, which is developing its own rocket and capsule). "We're talking to everybody that we can," Rominger said. "We've had a real good reception from the folks out there." Rominger estimated that Liberty could begin crew-carrying operations by 2015. The rocket could also eventually be used to launch satellites and other unmanned cargo, he added.